Plantar Fasciopathy is a painful condition affecting the sole of the foot, with pain usually localised around the front of the calcaneum and radiating along the middle of the sole of the foot towards the toes. There is usually point tenderness on the insertion of the plantar fascia onto the calcaneum. Plantar fasciopathy can be an acute condition related to a sudden increase in walking or a change in shoe support, or even a direct impact on the sole of the foot, such as stepping onto a rock. Often, on X-ray, there will be a bony spur protruding from the calcaneum related to the insertion of the plantar fascia. Interestingly, a large percentage of the population have heel spurs present, but these are usually asymptomatic. The heel spur itself is not usually significant in this condition unless conservative measures fail. 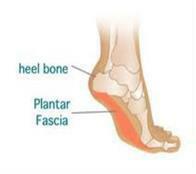 The most common pattern of plantar fasciopathy is of gradual onset related to faulty foot or lower limb biomechanics. Factors that may predispose the patient to developing this condition include over pronation of the foot or weakness of the hip abductors leading to internal rotation of the hip during full weight bearing during the gait cycle. WHAT TREATMENT CAN BE BENEFICIAL? Local physiotherapy treatment in the acute condition is usually able to settle the pain very quickly. This may include local releases and isometrics to settle inflammation, and low-dye taping or functional fascial taping techniques designed to take pressure off the plantar fascia. The tibialis posterior muscle must also be assessed as the activity of this muscle supports the longitudinal arch of the foot assisting the plantar fascia in its supporting role. The hip abductors, similarly, are assessed and strengthened as required, as is the vastus medialis muscle of the knee, all of which are required to be operating effectively to maintain lower limb stability. In the more gradual onset situation, more long term orthotic foot control, rather than just taping techniques, may be required, and in this case, the physiotherapist will prescribe suitable orthotics. In the acute situation, often local therapy and taping is enough to settle the condition, as long as the cause of the onset is known. However, if the condition has occurred due to biomechanical faults, then rehabilitation will include muscle re-education for the intrinsic muscles of the foot, tibialis posterior, vastus medialis and the hip abductors, as well as orthotic control. Commencing a physiotherapy monitored program for plantar fasciopathy rehabilitation should be commenced as soon as practical. This program is divided into 4 stages, with the first stage involving isometric contractions to decrease pain from the plantar fascia itself. Once the pain is under control, a calf strengthening program can be commenced. Your Move Well Physiotherapist can progress your rehabilitation program to ensure the best outcome. In extreme circumstances the spur may be removed but studies have shown that the rate of spur regrowth is high.